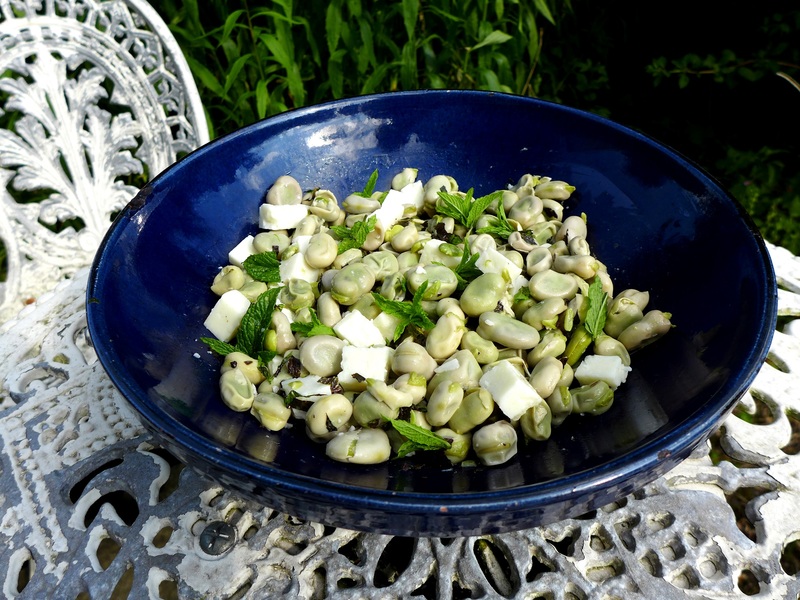 The end is nigh … the end of the broad bean season, anyway. This is such a simple salad I thought twice about posting it (‘am I insulting the skills of my readers?’) but hey, it’s delicious. It’s as good as a barbecue side dish as it is packed into a lunchbox for work, so here it is as a sort of bonus recipe. If you don’t like the outer skins on broad beans, slip them off after cooking. I don’t really think it’s necessary for this dish if the beans aren’t tough and old (in which case you should be using them for something else), but a double-podded broad bean can often convert those who swear they detest them. Bring a pan of lightly salted water to the boil, add the beans and cook at a simmer until tender. Drain thoroughly. If you want to double pod, do them after you’ve cooked them, it’s much easier. Whisk together the lemon juice, olive oil, salt and pepper. place the beans in a serving bowl and mix through the dressing while they’re still warm. Once cool, add the goat’s cheese, cut into cubes, and the shredded mint. Check the seasoning, garnish with the mint sprigs, and serve. This entry was posted in Vegetables and salads, Vegetarian and tagged broad bean and goat's cheese salad, summer salads by Linda Duffin. Bookmark the permalink. + have u ever tried Marò? is similar I guess to yr broad bean hummus: it comes from Liguria and it is a pesto of young, podded broad beans, a little garlic (not much), oil and mint: very good on pasta/bruschetta…. Sadly, broad beans from anywhere but your own garden are rarely as young as I’d like, so I’ve learned to think of skinning them as a soothing occupation. Why ARE shop-bought beans always so big? I’d pay more for younger ones. Broad beans are so delicious! I think some of the most wonderful salads are the simplest as well. This one is a perfect example. Of course, I like multi-layered involved salads as well, so what do I know?!!! Sometimes, simple is best 😀 I absolutely love the goat’s cheese/bean combo! The added mint is a new twist on the combo for me (summer savory in heaps is what I usually go with), but since our market is brimming with all sorts of beans right now, I’ll be able to give your minty version a go this weekend~ Thanks for the recipe~!